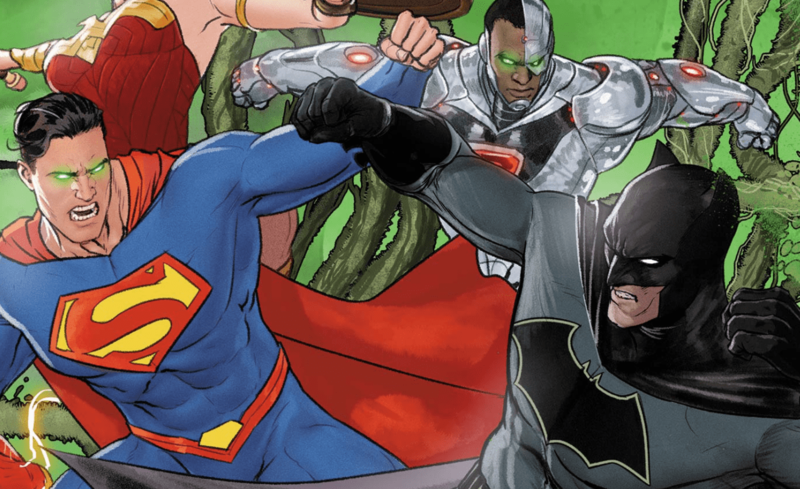 Batman #42 Review – AiPT! Who runs the world? Poison Ivy. And it looks like not even Batman and Catwoman can stop her. Well, that was weird. Like Alfred Hitchcock mixed with Twilight Zone mixed with Elseworlds Batman kind of weird. Excuse my language, but such was my immediate thinking upon finishing Batman #42, whose ending isn’t so much a surprise twist as it is a full-blown contortion. Given the circumstances of last issue, which saw Poison Ivy take control of everything and everyone in the world (except for Batman and Catwoman) to usher in a brand new planttopia — you’d figure more “weird” was to be expected. Poison Ivy still exudes an air of indomitability, puppeteering from her command center/sanctuary of vines and ferns — and she’s made it clear that Bat and Cat aren’t doing anything without her consent. She’s got Superman on house-sitting duty for starters. And constant surveillance from Flash, Wonder Woman and whoever else from the Justice League she feels like controlling too. However, Ivy can be a lenient empress-goddess too, as we find out when she allows Batman and Catwoman to grab some fast-food at the now familiar Bat Burger (which we last saw in Batman #16). But even as we glean new clues towards Ivy’s master plan (and a potential shortcoming in it), the underlying question still remains: why has Ivy allowed Batman and Catwoman, the only two people on Earth resistant to her mind-control, to stay alive? That’s when writer Tom King throws a haymaker into the narrative that makes the right cross Batman gave Alfred last issue look something like this. And just as King has managed to do time and time again in his multi-part story arcs — he’s left us scratching our heads and wondering how the hell he’s going to bring everything together in the grand finale. It’s hard not to feel tentative towards certain story choices, though. Namely, Batman’s methodology, which is reminiscent of the “tactics” he employed back in the “I Am Bane” storyline and far more reckless than we’ve seen the character act in any run in recent memory besides King’s. We still have one more installment of “Everyone Loves Ivy” to go, though and if Batman #40 (the whole Wonder Woman cave kiss thing) taught us anything — one can’t adequately judge King’s work until all is said and done. As always, stellar art from Mikel Janin and June Chung. King's narrative remains mysterious and parcels out the information in thrilling form. A fun, Hitchcockian vibe that permeates the entire story arc. If you didn't like Batman's strategy in "I Am Bane," you probably won't like it here either.